Jehan Numa Palace, Bhopal, M.P. Well ! Today the is a great a day for us as from surveying Bhopal to now Central India, we have searched every nook & corner of the state to who are the best in Channel & Retails, although we didn't separate the channel from retails it just the matter of time we able be able to do that, probable in coming years. It is more of a festival where we gather and celebrate and no doubt this concept of IT Diwas is catching fast. How I hope, this trend continues forever and we actually start greeting each other with and it becoming a sort of IT UTSAV. IT fraternity should make this day, their own. The enthusiasm shown by the Channels in state of Madhya Pradesh has made our will stronger to make the IT Diwas, a celebrative and a repetitive affair. In 2010, we will celebrate on again, hopefully on a much larger scale. That’s a promise! CHIEF GUEST : MLA, (NARELA) Bhopal. COMPUTER GALLERY PVT. LTD. INDORE. SD's No.1 Computer Vendor and Reseller of the Year 2009 in Madhya Pradesh. to Shri Sumeet Arora of Computer Gallery. SD's No.2 Computer Vendor and Reseller of the Year 2009 in Madhya Pradesh. to Shri Neeraj Israni of Pioneer Computers. SD's No.3 Computer Vendor and Reseller of the Year 2009 in Madhya Pradesh. to Shri Sanjay Jain of Microland Computers. SD's No.4 Computer Vendor and Reseller of the Year 2009 in Madhya Pradesh. to Shri Haseeb Mohd. of Centronix Computers. LATEST DEVICES PVT. LTD., BHOPAL. SD's No.5 Computer Vendor and Reseller of the Year 2009 in Madhya Pradesh. to Shri Bhupendra Gaur of Latest Devices. SD's No.6 Computer Vendor and Reseller of the Year 2009 in Madhya Pradesh. to Shri Prakash Chandra Gupta of Bootcom Systems. SD's No.7 Computer Vendor and Reseller of the Year 2009 in Madhya Pradesh. to Shri Nischal Namdev of Netcom Computers. SD's No.9 Computer Vendor and Reseller of the Year 2009 in Madhya Pradesh. to Shri Raj Soni of Computer Shoppe. to Shri Bhupendra Gaur of Latest Devices Pvt. Ltd.
to Shri Ashish Jain of Sam Systems. to Shri Manoj Dadlani of Channel Four. to Shri Sanjay Rawat & Shri Anurag Jesani of Taurus Micro Systems. to Shri Pramodh Talreja of Netlink Distributors. to Shri Mukesh Agrawal of Home Comforts. to Shri Amitendra Shrivastava of Coral Business Systems. SWIFT COMPULINK PVT. LTD., BHOPAL. to Shri Sameer Kapur of Swift Compulink Pvt. Ltd.
Zoom View SD's No.1 UPS Vendor of the Year 2009 in Madhya Pradesh. to Shri Pradeep Saxena of Weartech Engineers. Zoom View SD's No.2 UPS Vendor of the Year 2009 in Madhya Pradesh. to Shri Anand Jain of Technical Systems. R S POWER SOLUTIONS, INDORE. Zoom View SD's No.3 UPS Vendor of the Year 2009 in Madhya Pradesh. to Shri Rakesh Shrivastava of R S Power Solutions. Zoom View SD's No.4 UPS Vendor of the Year 2009 in Madhya Pradesh. to Shri Surendra Katiyar of Unitech Electronics. 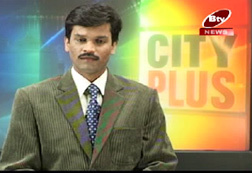 Zoom View SD's No.5 UPS Vendor of the Year 2009 in Madhya Pradesh. to Shri U S Gupta of Gental Enterprises. Zoom View SD's No.1 TPM Service Provider for the Year 2009 in Bhopal. to Shri Kursheed Ansari of Multitech Computers. 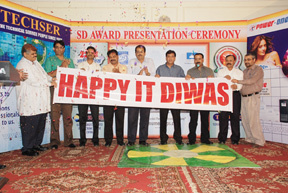 conduct the IT Diwas ceremony in such a grand fashion. 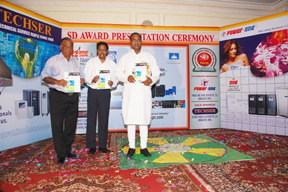 MAIN SPONSOR : NUMERIC POWER SYSTEM LIMITED., CHENNAI. PLATINUM SPONSOR : POWERONE MICRO SYSTEM PVT. LTD., BANGALORE. GOLD SPONSOR : TECHSER POWER SOLUTIONS PVT. LTD., BANGALORE.